Last month, a note was left on Tonya and Jayson Keefer's car about their blended family. The Keefers took to social media to raise awareness about adoption and love beyond blood and skin color. Something was stuck to the windshield. At first, Jayson and Tonya Keefer didn’t see the torn piece of paper left on their car. They had finished dinner at the Plant City Zaxby’s and were driving home with their children, Leah and Nathaniel. Tonya Keefer spotted the note flapping in the wind. She reached through the window and unfolded it. Give the black girl back to her mother. You and your husband are white trash. It was Sunday, Sept. 25. The Keefers had finished dinner with 20-plus people from Hopewell Baptist Church, where Jayson Keefer serves as the church’s youth pastor. Prior to opening the note left under the windshield wiper of the family car, Tonya Keefer had assumed it would be a joke or a forgotten reminder from a friend in faith. Just because the girl is black does not mean you have to treat her any different than your white child. You and your husband walked off and did not look back for the little black girl to make sure she got out of the car safely. Leah, 9, and Nathaniel, 20 months, were in the backseat of the car. Both are adopted. Both are loved equally and unconditionally. You should be ashamed. Seems like you’re racist. But the anger quickly subsided into something else: pity. Both of her children were born to addicts. Both of her children were abandoned by their birth mothers. Tonya and Jayson Keefer posted a response on Facebook to the note a stranger left on their car. The response has received over 300 shares on Facebook and has reached people in the United Kingdom, Australia and Germany. I guess finding a note like this on my car after dinner should make me angry. Maybe it did, but more than angry it made me feel really really sad. I pity the person who sees my family and can only see the colors of our skin because in our home we make no such distinction. In our home we choose not to define or be defined because of a color. The 'black girl' as you call her, is so much more than the label you place on her. She has a name, we call her Leah. She has a beautiful personality, a silliness that is endearing and a laugh that is infectious. She is talented and creative and hilarious. In fact as we drove into the zaxbys parking lot tonight she was bouncing and giggling in the back seat, being her incredibly unique self. See, you see a black girl in my back seat but not the countless prayers I prayed begging God for her. You can't see the times I've cried or lost sleep wondering if I was good enough for her. You see the 'black girl' with the white family but I see an answer to my prayers, my daughter, my miracle. I'm sorry that when you see my children you judge them by the difference in skin color, I truly am. Both of my children were abandoned by their birth mothers. Both of them were born to addicts. And both of them deserve the very best of life and I'll admit they deserve more than I could ever give them. Some people would even say my husband and I have done some great thing by bringing these children into our home but do you know what? These 2 children are my heroes. They are the reason I get up on days I don't feel like it. They are the reasons I smile when things aren't perfect. They are my joy, my hope and my life and I am so sorry that you can't see past the differences of our skin color to be able to see any of that. If this note ever finds you, I want you to know I am not angry and I would love to buy you dinner and offer you the chance to get to know our wonderfully unique family. God bless you! The couple fought to adopt them and fought to keep them. Their different races don’t make them less than part of one united family. Her children are her heroes. The note from the stranger was a shock to the Keefers, but it wasn’t a first occurrence. When living in Titusville, the Keefers were approached by a police officer while they were eating at a McDonald’s. Leah was laying in Tonya Keefer's lap. “The officer walked up and said there was a report of a suspicious couple with a black child,” Tonya Keefer said. The Keefers showed their adoption judgement — which they carry with them at all times for these very scenarios — to the officer. Much of the couple’s life has been based in sheer faith. After Tonya Keefer’s brother introduced her to Jayson Keefer, the couple became engaged in a month and married in six months. Soon, they were faced with infertility. 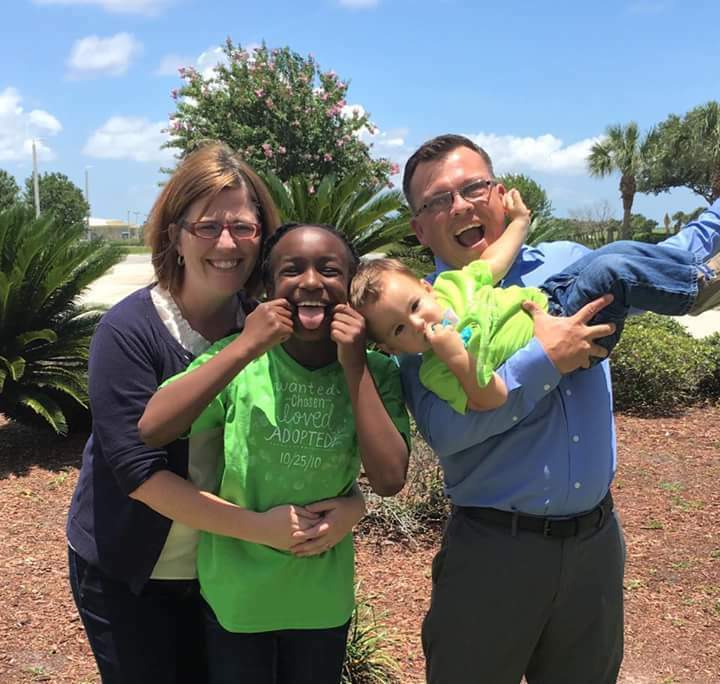 Five years into their marriage, the couple made the decision to become foster parents with the goal of adopting children. It was April 2007 when they were placed with Leah, then 14 months old. Leah had been with a different foster parent before, someone who warned the Keefers Leah was a fussy baby who wouldn’t eat. They were worried — until they got her. They knew she was the one. But the family had to be guarded. There was a chance Leah could be placed with a family member, as the goal of fostering is to put a child with a member of its biological family. Even so, the Keefers couldn’t help but fall in love with Leah — even when she was temporarily taken away. Immediately, the couple obtained their fostering license for the state of Georgia and traveled back to Florida every month to visit Leah. “We were claws out fighting,” Tonya Keefer said. After she was returned to their home, the family was told Leah’s distant relatives may want to adopt her. Eventually, a judge ruled in favor of the Keefers. Where do foster children live? For the Keefers, the risk was worth it. Tuesday, Oct. 25, will mark the sixth anniversary of Leah’s adoption. Recently, the Keefer family has grown once again. They finalized the adoption of Nathaniel in June. Nathaniel’s biological mother asked the family to take care of him, something the Keefers thought would be a temporary situation. “Fairly quickly we realized that it was going to be permanent,” Tonya Keefer said. Another adoption process. Another few months of dealing with red tape and paperwork. Only one certainty: unwavering faith. In her response to the note writer, Tonya Keefer turned to love — her love for God and her love for her children. They are the reason I get up on days I don’t feel like it, she wrote. They are the reason I smile when things aren’t perfect. When she looks at her children, she sees the struggle: the infertility, the unknown, the process. But she also sees their smiles. She sees her faith in God. She doesn’t see skin color.